Let us be your guide for selecting your GA and NC window treatments and innovative curtains for your space. 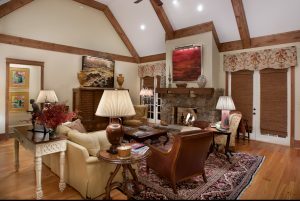 With a huge selection of Georgia and NC window treatments and exclusive products, including custom curtains, Highlands Decorating Center is the best place to search for home design related products in Western North Carolina and North Georgia. We can create custom window treatments and curtains for your space. Stop in our Design Showroom located in Highlands, NC and hand pick your custom curtain fabrics. We also specialize in plantation window shutters. Find out more about some of the window treatment options that we carry below. Hunter Douglas window treatments. Hunter Douglas brings many years of experience to window treatment design. Please click on the Hunter Douglas image to see the entire Hunter Douglas window treatment portfolio. Great GA and NC window treatments such as Silhouette, Brilliance Pleated Shades, Luminette, Country Woods, Duette, Woven Woods and many more Hunter Douglas products are available here at Highlands Decorating Center in Highlands NC; your one stop source for all your window treatment needs. Norman Shutters has over 30 years of manufacturing excellence. Norman Shutters in partnership with Highlands Decorating Center takes great pride in exceeding customer expectations with master craftsmanship, incomparable beauty, competitive pricing and distinctive wood shutter products. Norman Shutters extensive selection allows you to find the ideal plantation shutter for your windows. Your home, your life-Norman Shutters available in luxurious hardwoods or durable composites has a plantation shutter to match your needs for your Highlands NC home.